Stanford economist John Taylor’s many contributions to monetary economics include his introduction of what has become known as the Taylor rule (as named by others, not by John). The Taylor rule is a simple equation—essentially, a rule of thumb—that is intended to describe the interest rate decisions of the Federal Reserve’s Federal Open Market Committee (FOMC). The Taylor rule is a valuable descriptive device. However, John has argued that his rule should prescribe as well as describe—that is, he believes that it (or a similar rule) should be a benchmark for monetary policy. Starting from that premise, John has been quite critical of the Fed’s policies of the past dozen years or so. He repeated some of his criticisms at a recent IMF conference in which we both participated. In short, John believes that the Fed has not followed the prescriptions of the Taylor rule sufficiently closely, and that this supposed failure has led to very poor policy outcomes. In this post I will explain why I disagree with a number of John’s claims. Normally, the Fed’s “target” for real GDP is potential output, the amount the economy can sustainably produce when capital and labor are fully employed. With that assumption, the variable y in the Taylor rule can be interpreted as the excess of actual GDP over potential output, also known as the output gap. (2) for each percentage point that that output rises relative to its potential. The Taylor rule also predicts that when inflation is at target and output is at potential (the output gap is zero), the FOMC will set the real federal funds rate at 2 percent—about its historical average. In his 1993 paper, John showed that the rule described FOMC behavior over the previous half dozen years or so quite well. The Taylor rule provides a nice, simple description of how monetary policy has been made in the past. But what does it say about how monetary policy should be made? Originally, John did not seem to believe that his eponymous rule should be more than a general guideline. Indeed, in his 1993 article, he took pains to point out that a simple mechanical rule could not take into account the many factors that policymakers must consider in practice. (See my IMF remarks for a relevant passage from Taylor 1993. See also Taylor 1999.) I believe that John’s original view was sensible. As a policymaker I often referred to various policy rules, including variants of the Taylor rule. However, it seemed to me self-evident that such rules could not incorporate all the relevant considerations for making policy in a complex, dynamic economy. First, John argues that the FOMC kept interest rates much lower than prescribed by the Taylor rule during 2003-2005, and that this deviation was a major source of the housing bubble and other financial excesses. Second, he asserts that the Fed’s monetary policy since the financial crisis has not been sufficiently rule-like, and that policy has been too easy. He says that, if the FOMC had been following the Taylor rule, it would have ended its policy of near-zero interest rates several years ago. He blames much of the disappointing recovery on the Fed’s putative deviations from the Taylor rule. The basis of John’s claims is findings like those of Figure 1 below, which is my update of the original Taylor rule for the period 1993 to the present. To construct Figure 1, I followed Taylor’s original paper and measured inflation using the GDP deflator (more on this in a moment). To measure the output gap, for the period through 2009 I used estimates prepared by Federal Reserve staff for FOMC meetings, which are disclosed after a five year lag. For 2010 through the present, for which Fed staff estimates of the output gap are not yet publicly available, I used estimates produced and published by the Congressional Budget Office. Importantly, for all figures in this post, I used only data that were known to policymakers at the time they made their decisions. Because initial data are often substantially revised, using real-time data is essential for evaluating policy choices. (See my note for more information about data sources and this file for the data itself). As you can see, the figure shows the actual fed funds rate falling below the Taylor rule prescription both in 2003-2005 and since about 2011. That is, if the Taylor rule shown in Figure 1 is the benchmark, then monetary policy was at least somewhat “too easy” in both those periods. I responded to assertions similar to John’s first claim, that too-easy money caused the US housing bubble, in a 2010 speech. Briefly, I argued there that the Fed’s interest-rate policies in 2003-2005 can’t explain the size, timing, or global nature of the housing bubble. I won’t repeat those points here. Instead, I want here to address John’s critique on its own grounds, by examining whether it’s really true that—relative to a plausible Taylor rule benchmark—US monetary policy was too easy during 2003-2005 and in the period since the crisis. To check the robustness of John’s claims, I calculated the policy predictions of a Taylor-type rule that was modified in two ways that seem sensible to me. First, I changed the measure of inflation used in the Taylor rule. In his 1993 paper, John chose to measure inflation using a price index known as the GDP deflator (I used that measure of inflation in constructing Figure 1 above). However, when talking about inflation, economists (and the FOMC) usually mean the rate of increase of consumer prices. The GDP deflator incorporates not only the prices of domestically produced consumer goods and services, but also other categories of prices, such as the prices of capital goods and the imputed prices of government spending (on defense, for example). It also excludes the prices of imports, including imported consumer goods. Second, it’s important to consider how policy responds, quantitatively, to changes in inflation and the output gap. The original Taylor rule assumes that the funds rate responds by a half-percentage point to a one percentage point change in either inflation or the output gap (that is, the coefficient on both variables is 0.5). In principle, the relative weights on the output gap and inflation should depend on, among other things, the extent to which policymakers are willing to accept greater variability in inflation in exchange for greater stability in output. Some research subsequent to John’s original paper, summarized by Taylor (1999), found a case for allowing a larger response of the funds rate to the output gap (specifically, a coefficient of 1.0 rather than 0.5). In my experience, the FOMC paid closer attention to variants of the Taylor rule that include the higher output gap coefficient. For example, Janet Yellen has suggested that the FOMC’s “balanced approach” in responding to inflation and unemployment is more consistent with a coefficient on the output gap of 1.0, rather than 0.5. In my modified Taylor rule I assumed the higher coefficient on the output gap. Figure 2 below shows the predictions for the federal funds rate of my preferred version of the Taylor rule, which measures inflation using the core PCE deflator and assumes that the weight on the output gap is 1.0 rather than 0.5. As you can see in the figure, the predictions of my updated Taylor rule (green line) and actual Fed policy (dashed black line) are generally quite close over the past two decades (the green line starts in 1996 because real-time data for the core PCE deflator are not available before then). In particular, it is no longer the case that the actual funds rate falls below the predictions of the rule in 2003-2005. As John points out, the US recovery has been disappointing. But attributing that to Fed policy is a stretch. The financial crisis of 2007-2009 was the worst at least since the Depression, and it left deep scars on the economy. The recovery faced other headwinds, such as tight fiscal policy from 2010 on and the resurgence of financial problems in Europe. Compared to other industrial countries, the US has enjoyed a relatively strong recovery from the Great Recession. In short, Figure 2 argues against Taylor’s two criticisms, on their own terms. Relative to a modified but plausible Taylor rule, monetary policy since the early 1990s seems reasonable and consistent. It could be argued, of course, that my two modifications of the original Taylor rule are not reasonable. Frankly, I don’t think there is much of a case for not employing real-time data or for using the GDP deflator to measure inflation rather than using overall or core PCE inflation. With respect to the choice of the weight on the output gap, the research on Taylor rules does not provide much basis for choosing between 0.5 and 1.0. However, the choice of 1.0 seems best to describe the FOMC’s efforts to support job growth while also keeping inflation close to target in the medium term. I also note an odd feature of the Taylor rules I estimated with the original coefficient of 0.5 on the output gap. No matter what inflation measure is chosen, such rules tend to imply that Fed policy was too tight in the 1990s, as well as too easy in 2003-2005. (You can see this result for the GDP deflator in Figure 1. It’s also true if overall PCE inflation is used as the inflation measure.) If easy money is an important cause of bubbles, how can the large gains in the stock market in the 1990s be reconciled with monetary policy that appears if anything too tight? I’ve shown that US monetary policy since the early 1990s is pretty well described by a modified Taylor rule. Does that mean that the Fed should dispense with its elaborate deliberations and simply follow that rule in the future? In particular, would it make sense, as Taylor proposes, for the FOMC to state in advance its rule for changing interest rates? 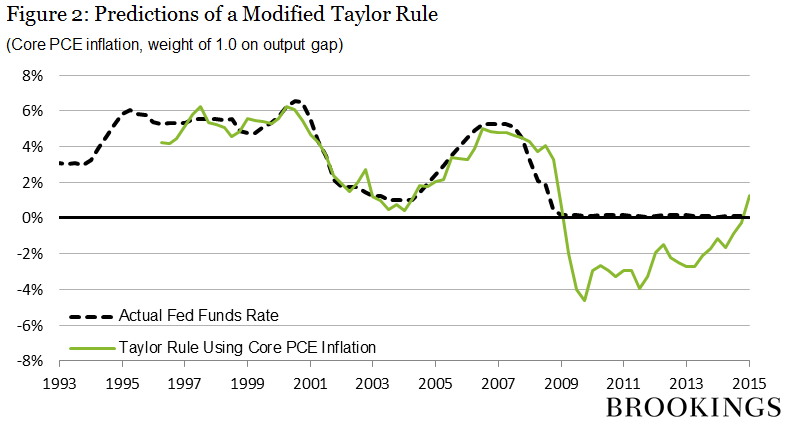 The Taylor rule assumes that policymakers know, and can agree on, the size of the output gap. In fact, as current debates about the amount of slack in the labor market attest, measuring the output gap is very difficult and FOMC members typically have different judgments. It would be neither feasible nor desirable to try to force the FOMC to agree on the size of the output gap at a point in time. The Taylor rule also assumes that the equilibrium federal funds rate (the rate when inflation is at target and the output gap is zero) is fixed, at 2 percent in real terms (or about 4 percent in nominal terms). In principle, if that equilibrium rate were to change, then Taylor rule projections would have to be adjusted. As noted in footnote 2, both FOMC participants and the markets apparently see the equilibrium funds rate as lower than standard Taylor rules assume. But again, there is plenty of disagreement, and forcing the FOMC to agree on one value would risk closing off important debates. 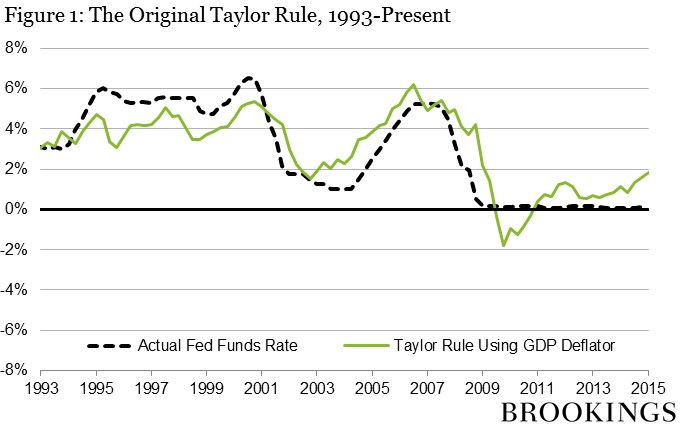 The Taylor rule provides no guidance about what to do when the predicted rate is negative, as has been the case for almost the entire period since the crisis. There is no agreement on what the Taylor rule weights on inflation and the output gap should be, except with respect to their signs. The optimal weights would respond not only to changes in preferences of policymakers, but also to changes in the structure of the economy and the channels of monetary policy transmission. I don’t think we’ll be replacing the FOMC with robots anytime soon. I certainly hope not. 1. To reiterate, core inflation is used because of its predictive properties for overall inflation, not because core inflation itself is the target of policy. I showed in my 2010 speech that the results are similar to those below when real-time forecasts of inflation are used instead. 2. I caution against reading too much into the fact that the modified Taylor rule predicts a positive federal funds rate at the far right end of the figure. The FOMC has many factors to consider in its decisions. For example, the Taylor rule used in Figure 2, like the original Taylor rule, assumes that the long-run real funds rate is 2 percent. If the equilibrium real funds rate is lower than that, as both financial markets and FOMC participants appear to believe, then the modified Taylor rule used in Figure 2 may currently be predicting a funds rate that is too high.